As you will have probably noticed I've become very interested in the First World War in the last couple of years. With the OH's family coming predominantly from Barnsley I have found connections to soldiers in the Barnsley Pals along with many others. As I have access to local resources in Barnsley Archives (newspapers, books, archives from churches and other local research) and an ever growing personal experience researching soldiers my lists of 'favourite' soldiers are getting longer and longer, but most of them are Yorkshire based. My own family comes from the North East of England and so far I haven't done very well finding out about my own WW1 ancestors. Hopefully this new project, "Lives of the First World War", from the Imperial War Museum will help with that - as a national project they aim to link together the personal stories of everyone who was involved in the First World War; soldiers, sailors, nurses and civilians too! I subscribed to their email link some months ago and on Thursday last week I received an email asking me to log in to the beta site and give it a try out. The aim is to collect lots of feedback to iron out bugs before the project goes fully live. The project has been pre-loaded with information from the WW1 Medal Cards so includes only men who served abroad at the moment - there are plans to add the men who served at home and the other categories as the project progresses. You search for a man by name, unit or service number and then 'remember' them to add them to your own personal 'dashboard'. This creates a list of men that you can refer back to easily. I began by 'remembering' a couple of my favourite Barnsley soldiers, Alonzo Wilson Swallow, Reginald Leslie Duncan and Frank Armitage. Last year I created a World War One Soldiers' Stories tab on my blog and started a list of the stories I had researched in depth and written up with links so that it was easy to find them again. This was very useful for looking up the work I had already done on these men. Finding Alonzo wasn't actually that easy - the seed information is only as good as the transcriptions of course, that's why they are relying on crowd-sourcing to correct these errors. On his medal card I must admit Alonzo's name is very hard to read unless you know what you are looking for. It took some cross referencing with his service number to work out that the entry for George N Swallow was my man ... does the name above look like George to you? Hmm, struggling ... Cross checking on The National Archives medal card pages I see that this is where the mistake originated. He is correctly indexed on Ancestry - I wonder if I submitted a correction to that at some point in the past? It is fairly easy to amend the information on the Lives of the First World War site ... well, once you've worked out that the way to do it is to "improve" an entry. Now he's got the right name and you can see some of the other information I've been adding. This could be a long job as each source has to be added and verified (by saying what reason you have for connecting it to the soldier). 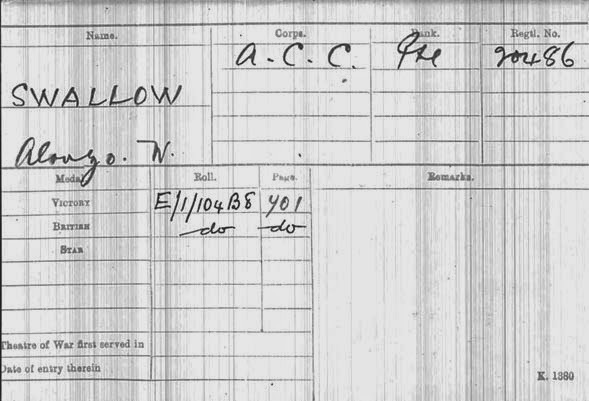 Then you can click on a source and start picking out bits of information to record, so from Alonzo's WW1 Service Records (as an external link by putting in the Ancestry website address) I have been picking out the dates when he changed regiment from the 2nd/5th York and Lancaster to the West Riding Cyclist Company and then the Army Cyclist Corps. When I finally managed to get all the dates in the right order the header, shown above, did show his last regiment and service number, the ones indicated on his medal card - the Army Cyclist Corps and no.20486. It looks as if, when it goes live, people will be able to link to all kinds of data from the DC Thompson stable of websites - I can currently pick census returns and BMD index entries to link directly - of course DC Thompson also own Find My Past and the British Newspaper Archive. This part of the process will need you to be a subscriber (charges not yet specified) but anyone will be able to add personal information, pictures and stories for free. During the beta testing there are no charges to the testers (which is good!). There is a tantalising note that the Commonwealth War Graves Commission information is to be linked directly "allowing you to add this key moment to a Life Story". I guess as I work my way around the system a few times I will learn the ropes and stop having to double back to amend things or add them differently. That's the whole idea of beta testing I suppose. What with all the other stuff I am working I might not be able to give this much time - but it is fun trying out something new and I look forward to the day someone else 'remembers' one of my Barnsley men or I find a link to one of my North Eastern ancestors with lots of information already entered by someone else.